The conscious competence learning model has uncertain origins, but is probably the best known model for learning. Maybe that's because it is so simple and intuitive - I suspect making it exactly the right kind of 'model' to be picked up by the business book and management consulting fraternity. It seems to me best applied to the development of "skills" (like riding a bike or programming in python), and less so to changing bahaviour or habits (like giving up smoking). But for skills it works really well, and the simple 2x2 matrix of conscious-competence yields lots of interesting observations to ponder. That's my version of the matrix. I re-label the "conscious" axis as either "self-conscious" (as in you are painfully aware that you can't do something), or "automatic" (where you have reached the stage where performance is reflexive). Where you start, where you get to, and the path you take are really dependent on the situation and the individual. 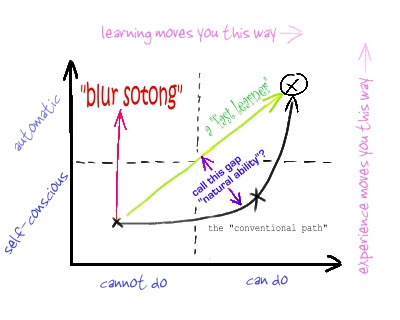 In the picture above, I've indicated a starting point of where you are self-conscious about the fact you can't do something; although the literature talks about the strict theoretical starting point of being totally unaware you can't do something (automatic - cannot do in the diagram). So anything interesting to note? How straight-line your pregession towards automatic-can do is probably a good guide of "natural ability"
Experience (or practice with reflection) tends to move you up the conscious scale towards the point where it is automatic. So is this model of any practical use? As a point of reflection on your own, or your collegues situation, I think it can be a good but crude diagnostic. It makes you remember things like just plain training needs to be coupled with real experience to get you all the way up the curve.